We can only speculate as to what the personal relationship between Eagles’ Head Coach Chip Kelly and their former star running back LeSean McCoy was like. Was the trade an effort to bend the Eagles’ locker-room to Kelly’s will? Was the move the latest measure taken by Kelly, who is both Head Coach and General Manager, to rid himself of the most noteworthy and opinionated Eagles’ players from the Andy Reid era? Both are poignant questions but only Chip Kelly and a few individuals in Philadelphia’s organization know the true motivation behind these personnel decisions. While we consider the philosophical purposes behind this trade we must also analyze the on-field and front office implications of the deal. The first thing that comes to mind when analyzing this trade from a football perspective is what LeSean McCoy meant to the Eagles offense under Chip Kelly. Prior to Kelly’s arrival McCoy had established himself as one of the most dynamic ball-carriers in the NFL. Over the last two seasons, in Kelly’s up-tempo, spread option system, McCoy has amassed over 3,000 yards rushing and added a rushing title to his credit. The 2014 season didn’t quite live up to his 2013 performance as the Eagles’ offensive line struggled with injuries early on and the addition of Darren Sproles siphoned some of LeSean McCoy’s touches, but he still managed over 1300 yards rushing. The biggest difference and concern between 2013 and 2014 was the fact that McCoy averaged 4.2 yards per carry in 2014, nearly a full yard less per tout compared to 2013 (5.1). Part of the drop off in production should be attributed to opposing teams adjusting to Kelly’s offense. Case in point, in 2013, Nick Foles had a 27:2 TD/INT ratio compared to 13:10 in an injury shortened 2014 campaign. The World’s Fastest Adapting Organism (an NFL defense), the phrase coined by Warren Sapp, held true and Kelly’s offense found it more difficult to be successful on a consistent basis in year two of his tenure. Did the NFL adjust to Chip Kelly’s plug and play offense that had seemingly revolutionized the NFL? Chip Kelly might argue that LeSean McCoy’s improvisational running style didn’t maximize what yardage was available however minute. No one can reasonably disagree with the observation that McCoy routinely danced in the backfield in attempt to create a big gain as opposed to simply taking what’s available. This put the Eagles behind in the down and distance which ultimately disrupted the tempo Kelly so desperately wants to establish offensively. As a result, McCoy began to lose more carries and opportunities to Darren Sproles and Chris Polk. As for the Buffalo Bills, Rex Ryan gets an upper-echelon tailback to feature in what figures to be a run-heavy offensive approach. McCoy isn’t a 220 lbs. banger but at 27-years-old, workload shouldn’t be a concern particularly if 5-7 of what I suspect will be 20-25 touches a game come via the passing game. McCoy excels in the open-field and is a nightmare for defenses from an elusiveness perspective once at the second level. C.J. Spiller will be moving on which means the Bills’ offensive weapons will consist primarily of McCoy, Sammy Watkins and Robert Woods a formidable group of young playmakers. If Buffalo can get some competent play out of the quarterback position they may have a legitimate shot of unseating the New England Patriots in the AFC East considering the Bills’ excellent defense. Speaking of defense, there is an impressive young linebacker headed to Philadelphia in this deal in Kiko Alonso. Alonso, had a fantastic season in 2013, registering 159 tackles, 2 sacks and 4 interceptions making plays sideline-to-sideline for the Bills. Many believed he deserved NFL Defensive Rookie of the Year honors but placed a close second to the New York Jets’ defensive tackle Sheldon Richardson. Unfortunately, Alonso tore his ACL working out during the off-season and missed the entire 2014 season. Which makes this trade all that much more interesting. Of course Alonso is still a very young athlete (24-years-old) and is expected to make a full recovery but he doesn’t have much of a body of work, at least not the body of work that would prompt most coaches and/or general managers to trade their most talented offensive player to acquire him. Kelly certainly is familiar with Kiko, having coached him at Oregon and on paper he and Mychal Kendricks could form quite the pair of inside linebackers but regardless how the coaches and talent evaluators value (or de-value) the running back position 3,000 yards in a two-year span doesn’t just grow on trees. From a front-office perspective this trade certainly frees up a significant amount of cap space for the Eagles. McCoy was set to count over $8 million dollars against the cap and Alonso is expected to make just under $750K this season. By all accounts Kelly values the quarterback position and the offensive line over everything else. With all the recent cuts, Kelly, has created $50 million in cap space and is expected to bid heavily when free agency opens March 10th. 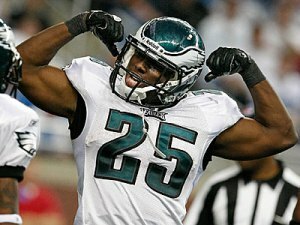 However, the trade of LeSean McCoy, a respected talent throughout the league in addition to Kelly’s reputation for holding atypically, grueling practices even on Saturdays prior to game day Sunday may result in veterans being hesitant and less likely to sign with Philadelphia. Former NFL players LaVar Arrington and Eric Davis both stated that they probably wouldn’t play for Kelly on the heels of the some of his recent personnel decisions and reputation citing the fact that players talk, and share information. There is an underlying sense that veterans are leery about playing for the Eagles, more specifically Chip Kelly. Now, if Kelly throws around enough guaranteed $$$ it won’t matter but that could very well end up hurting the Eagles in the long run if they overpay and don’t get a return on their investment. Part of me feels like the Eagles should have got more. Certainly, convincing someone to take on McCoy’s hefty contract has to be factored into the equation but the Eagles traded perhaps their most valuable commodity on offense to acquire a promising player coming off of a serious knee injury without any additional compensation, namely additional draft picks. It has been rumored for ages now that the Eagles would like to move up in the first-round in order to draft Heisman Trophy Winner, Marcus Mariota, who played for Kelly and excelled in his system at Oregon. Not sure how the Eagles get it done now. It’s still possible I suppose. Nick Foles remains a valuable piece in a quarterback starved league, but the likelihood of making that draft day move seems more remote than ever. If Kelly was so convinced that he needed to move on from McCoy, he could have potentially used him as the lynchpin to move up far enough in the draft to give the Eagles a legitimate chance at drafting Mariota. Well, that ship has sailed. Perhaps the plan is to trade away the entire 2015 draft and a 2016 first-round pick to land Mariota and use that $50 million to round out the remainder of the roster. Conventional wisdom suggests that would be a mistake considering the teams that consistently compete for championships build their teams through the draft and retain their own players. 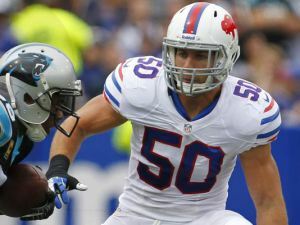 Unless Kiko Alonso becomes a truly dominant force in the NFL the Bills should be able to recover from the loss. Expect the Bills to sign David Harris when free-agency starts, a Rex Ryan favorite, to replace Alonso in the middle of Buffalo’s defense. Harris doesn’t have the same three-down potential Alonso has but he is a run-stuffer extraordinaire and knows Ryan’s system inside and out. The play of Preston Brown last season in Alonso’s absence certainly made this decision easier as well. The Bills are expected to approach McCoy with regards to restructuring his contract but you shouldn’t expect LeSean to acquiesce readily. Rex Ryan, often considered the “ultimate” players’ coach, will attempt to get McCoy to buy-in and make a case for a scenario in which both player and team can be satisfied regarding his contract. Rex Ryan and the Bills’ front-office should be pleased with themselves. They managed to acquire the feature component of their offense for a player that missed his second-year in the league in its entirety. As for Chip Kelly, it would appear he got what he wanted as well. Full control of the locker-room and a boat load of spending money. Don’t be surprised if Kelly continues to be aggressive and seeks additional trades to over-haul a roster that won 20 games over the last two seasons (Was an overhaul warranted?). Ultimately, it comes down to wins. Kelly, has placed additional pressure on himself to turn Philly into a perennial championship contender after making very aggressive and at times controversial personnel decisions. He better win, because the only thing that matters now is what he does after he traded LeSean McCoy.